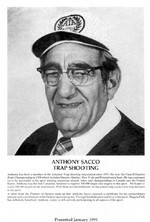 Anthony has been a member of the Amateur Trap Shooting Association since 1955. He won the Class D Eastern Zone Championship in 1958 which included Ontario, Quebec, New York and Pennsylvania State. He continued on to be successful in his sport winning numerous awards, titles, and championships in Canada and the United States. Anthony was the first Canadian Amateur to register 100,000 single clay targets in this sport. He hopes to reach 200,000 targets in the near future. With these accomplishments, he has joined only a select few trap shooters in his sport. A letter from the Premier of Ontario sums up that Anthony Sacco received a certificate for his extraordinary interest and contributions in his Ontario sports program. Through his dedication and love to his sport, Niagara Falls has definitely benefitted. Anthony, today, is still actively participating in all aspects of his sport.